VeryPDF PCL Converter SDK is a software development kit designed to assist you, the software programmers, to quickly add a PCL conversion utility to your own applications. This PCL conversion utility can convert print files (PX3, PXL and PCL) to PDF, PS, JPG/JPEG, BMP, TIF/TIFF, etc. and make different settings for output file. VeryPDF PCL Converter SDK encapsulates all the components required for quick integration. It allows software developers or programmers to quickly integrate PCL converter component in other applications programmed in Visual C++, Visual Basic, etc. development environments. In the following contents, you will some samples which illustrate proper usage of VeryPDF PCL Converter SDK. Caption = "Convert PCL file to PDF file"
strInPCL = App.Path & "\test.pcl"
strOutPDF = App.Path & "\test.pcl.pdf"
strCmd = "-$ XXXXXXXXXXXXX "
strCmd = strCmd & " """ & strInPCL & """"
strCmd = strCmd & " """ & strOutPDF & """"
To know more usage about the SDK package, you can download VeryPDF PCL Converter SDK and try it in your own development environment. 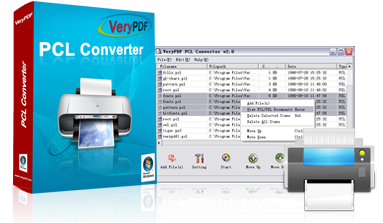 To get full version of the SDK package, you can buy VeryPDF PCL Converter SDK here. Support all features of VeryPDF PCL Converter SDK except owning a user interface. Allow software programmers to integrate the codes and APIs of the program into other applications.